AccuWeather.com - Weather Video - Could a Solar Flare Destroy the Earth? how harmful could it be? A tornado touched down this afternoon right outside of Dexter, MI today. An unconfirmed report stated that it was an EF3 and the NWS continued to report golf ball sized hail and severe thunderstorms and heavy rain for the area. Thankfully they had storm sirens so an early warning helped ( Per CNN). The Weather Channel reported that, so far there were no reported deaths or injuries. I suggest everyone be weather aware, check your daily news for weather reports.. Better yet, buy a NOAA Weather Alert Radio.. This month NASA will launch 5 sounding rockets to reach a height of 60 - 65 miles above the surface of the Earth. Called ATREX, which stands for, "The Anomalous Transport Rocket Experiment, is a project to study the High altitude Jet Streams which are higher than the common jet streams used in weather forecasts. These High Jet Streams travel at incredible speeds up to 200- 300 miles an hour and are located near the area in our upper atmosphere that also has strong electrical currents triggered by solar radiation that reaches the Earth. These strong electrical currents in the Ionosphere, have an effect on radio and communication satellites. 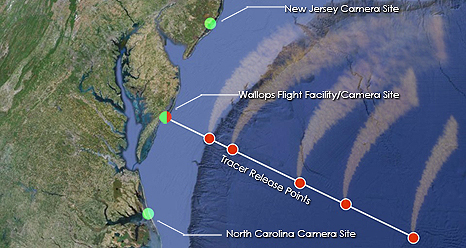 The five rockets that will be launched and possibly visible by those living near the Mid Atlantic area, will distribute a chemical tracer that will leave a milky clouds to track these Jet Streams. Please be on the lookout for these five NASA rockets on March 15th, and may be seen sometime between midnight and 1:30 AM Eastern. From the photo below you can see the area where cameras will be set up from New Jersey to North Carolina to view the pigmented clouds. Another issue is that there is a slight chance that an Aurora can be seen as far south as Pennsylvania tonight (3/12). Here is a Map of where the Aurora is most likely visible tonight.